Ionic Industries is an Australia-based graphene developer that was spun-off from Strategic Energy Resources (SER still holds 20% in Ionic) in 2015. 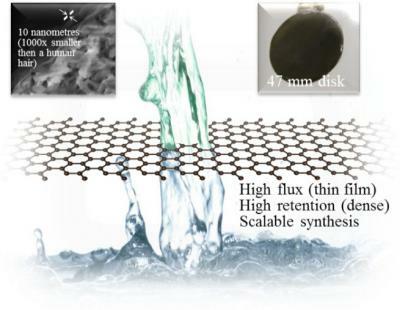 Ionic Developed a proprietary Graphene Oxide production process and is developing GO-based materials and applications. Simon Savage, Ionic's Managing Director, was kind enough to discuss the company's technology and the status of Ionic's GO applications. Since the start of its research programs in in 2010, Ionic has been focused on development of GO applications, however it was not possible to buy GO from other sources at that time. Because of this and recognising the importance of high-quality, tailored GO Ionic has also pioneered ways of producing GO in concurrent lab- and bench-scale programs. Ionic constructed its own R&D production line, which is is still producing GO for Ionic's own usage, and Ionic will use this GO in some applications, but when large scale material volumes will be required, Ionic plans to outsource its GO from a producer that will adopt its processes. In fact, the company is now looking for graphene producers to establish a joint-venture on GO production using its process. Ionic is now focused on four main applications. The first one is the GO-coated sand, for use in water filtration and industrial processing. This material will function as a substitute product for activated carbon, and the company sees its main market in water treatment - as an adsorption material. 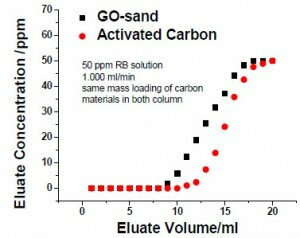 Unlike some activated carbon products, the GO sand can be recycled and ongoing development work is focusing on methods for cleaning and reusing in various applications. Super Sand can be very cheap to produce, and is stronger than activated carbon. Simon tells us that a gram of GO can coat about a hundred grams of sand. If this technology is adopted in bulk commercial applications , a huge amount of GO will be required. Ionic is also developing GO membranes, again for water filtration and other nano-filtration applications. GO can make for strong and efficient membranes that can be used to lower the cost of nano-filtration as less energy is needed to drive the water through those membranes. The physical properties of these membranes will also result in much lower maintenance costs for a broader range of applications that current polymer membrane technology. The same GO membrane has another fascinating use - Ionic is looking into Lithium-Sulfur batteries (Li-S) that use these membranes to protect the sulfur cathode. This helps to solve one of the major issues of this technology - the fast degradation of the cathode. The semi-porous nano-filtration membranes allow the lithium-ion particles through, but not the sulfur ones. The theoretical performance characteristics of Li-S batteries have bee well-understood for many years and this application may be the innovation that is required to bring the technology to life. Ionic has already produced a coin-sized battery prototype and the next stage will be to incorporate this technology into other commercial form factors for use in electric vehicles or renewable energy applications. Finally, Ionic is also developing micro planar supercapacitors, using its GO materials. 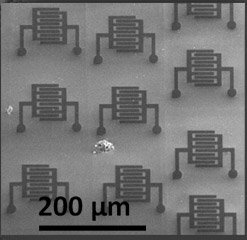 Again, Simon is excited about this potentially revolutionary research and earlier results have been promising - the planar-GO structure will enable a device with extremely high energy and power density, very fast charging and practically unlimited charge-discharge cycles. The company has recently made significant advances around electrode geometry, printing substrate, GO "ink" formulation and electrolyte composition. Compared to its other projects, though, this is a longer-term one, due to the immaturity of the global market for energy storage devices with these performance attributes. Ionic aims to have a prototype device in 12-18 months with potential commercial applications in 2-3 years.